Throughout our 50+ year history, we've refined and enhanced our products with a broad collection of tools that go far beyond simple visualization to sophisticated measurement and analysis. 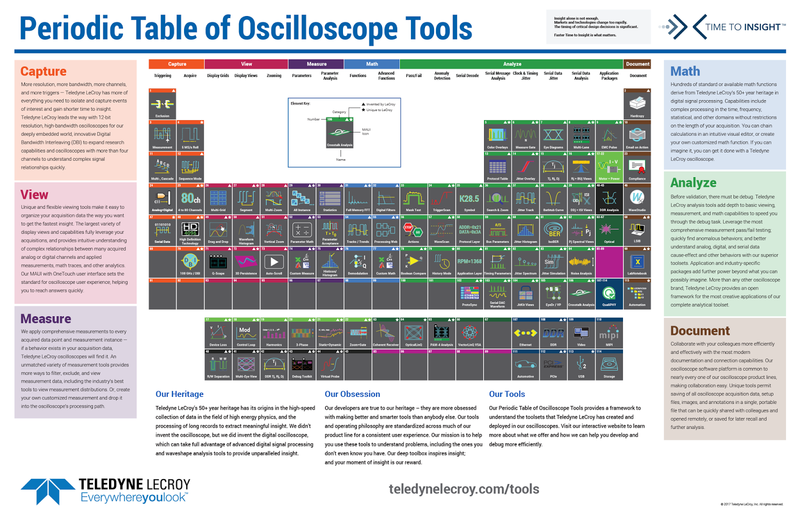 We have what we think is a unique way of representing our toolset as a Periodic Table of Oscilloscope Tools (Figure 1). This will be the first in a series of posts breaking out the six major segments of the table: Capture, View, Measure. Math, Analyze, and Document. Before you can measure or analyze signals, you have to capture them. We break down our Capture tools into two categories of a) triggering and b) acquisition. Most of the signals we want to capture with an oscilloscope are of a repeating nature. The triggering system of an oscilloscope aligns repetitions of such a signal with the triggering point on the display's horizontal axis (time). Exclusion triggering allows the oscilloscope to trigger on a waveform event that falls inside, or outside, of a specified range. Exclusion triggering uses various Teledyne LeCroy "smart triggers" to look for specified conditions related to pulse width, glitches, intervals, runts, and slew rates. Measurement triggering lets you use many of the oscilloscope's measurement parameters to locate a specified measurement of interest in an acquisition, stop the acquisition, and indicate the "triggered" position as if a normal hardware trigger condition was satisfied. Nearly 40 measurement parameters are supported. Multi-state/cascade triggering permits triggering on combinations of conditions. For example, the Qualified A+B trigger finds simultaneous occurrence of a pair of events. Qualified First triggers on multiple events by arming the trigger on the "A" event and triggering repeatedly on the "B" event after the "A" condition has been satisfied once. Cascade permits up to four stages to be defined with up to three stages as cascading arming events. Analog+Digital triggering permits complex logical patterns for various analog inputs. Up to eight analog inputs (using oscilloscopes such as the HDO8000A) can be defined as a trigger condition, with logic conditions among all of the channels definable as AND, NAND, OR, or NOR. Oscilloscopes equipped with digital inputs (MSOs) can combine analog patterns with up to 36-bit digital patterns at 500 MHz digital clock rate on some models. The high-speed Digital Analyzers (HDA125) provides support for up to 18-bit digital patterns at 12.5 GS/s sample rate, and can be combined with four analog inputs on supported oscilloscopes for high-speed, complex analog+digital pattern triggering. A variety of serial data triggers are available, including more than 15 for low-speed serial protocols for embedded, automotive, military/avionic, and serial audio applications, such as I2C, SPI, UART, RS-232, CAN, LIN, FlexRay, ARINC, and more. Roll mode enables simultaneous display of very low-speed and long-duration acquisitions. For acquisitions of several seconds or longer, Roll mode provides immediate visual feedback of the acquisition before it is completed. Teledyne LeCroy provides Roll mode capability at sample rates up to 5 MS/s for acquisition durations of 1 second or longer. Sequence mode captures only the signals of interest (defined by the trigger condition) and ignores the "dead time" between triggered events. Capture thousands of triggered acquisitions (segments) in one sequence-mode acquisition while missing no events of interest (that satisfy the trigger condition) for the duration of the sequence mode capture time. In addition, for each segment, time stamps are stored along with inter-segment time, so that the exact timing with nanosecond resolution is available to the user for each segment acquired. From four to 80 channels can be connected together at real-time bandwidths up to 100 GHz using modular acquisition systems and Teledyne LeCroy's ChannelSync™ architecture. This is highly useful for high-speed, multi-lane electrical serial data validation, complex DP-QPSK or DP-16-QAM optical analysis, or optical coherent MIMO or space-division multiplexed signals. At lower bandwidths, the HDO8000A Series provides eight channels in a single oscilloscope package for twice the number of channels, which serves three-phase Motor + Power power conversion analysis, deeply embedded systems, digital power management, and physics applications. HD4096 high definition technology provides 12 bits of vertical resolution (4096 vertical levels) compared to conventional 8-bit oscilloscopes (256 vertical levels) and low noise for uncompromised measurement performance – 16x closer to perfect, dramatically crisper and cleaner, and displayed more accurately. Digital Bandwidth Interleaving (DBI) was invented by Teledyne LeCroy as a means of measuring the performance of next-generation, high-bandwidth chipsets with real-time oscilloscopes. DBI splits the oscilloscope high-bandwidth input signal path into two or more distinct paths and uses RF technology to downconvert the highest frequency path(s) into a lower frequency range within the bandwidth capability of the oscilloscope's front-end and ADC. After digitizing, we upconvert the high-bandwidth path and re-combine it with the lower-bandwidth content using digital signal processing (DSP). Current real-time bandwidth obtained with DBI technology is 100 GHz with 240 GS/s. 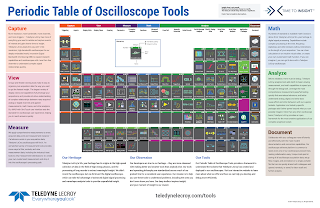 The next installment in this series will cover the View section of the Periodic Table of Oscilloscope Tools.